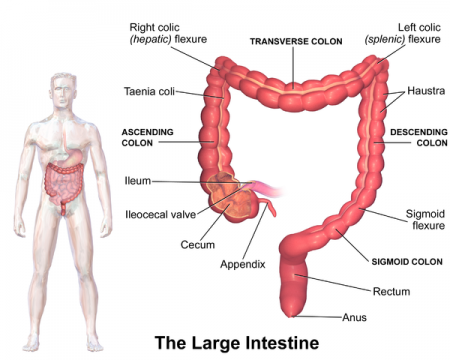 The cecum is the cul-de-sac at the beginning of the large intestine that descends from the union of the ileum and the large intestine. It provides a space for the mixing of bacteria with partially digested food from the small intestine to form feces. The cecum is a short, pouch-like region of the large intestine between the ascending colon and vermiform appendix. It is located in the lower right quadrant of the abdominal cavity inferior and lateral to the ileum. The cecum plays an important role in the digestive system by assisting in the formation of feces. Partially digested food, known as chyme, passes through the small intestine where it is digested and most of its nutrients are absorbed. The ileocecal sphincter at the end of the small intestine opens and closes to allow small amounts of chyme to enter the cecum at the beginning of the large intestine. Chyme is next mixed with bacteria by contractions in the walls of the cecum, before being pushed upward into the ascending colon. The cecum consists of four distinct tissue layers that work together to achieve the organ’s function. - The innermost layer, the mucosa, is made of smooth mucous membrane with many goblet cells. Goblet cells secrete mucus to lubricate and protect the surface of the cecum. Absorption of nutrients is performed by the epithelial cells forming the surface of the mucous membrane. - Surrounding the mucosa is the submucosa layer that contains the blood vessels and nerves that support the surrounding tissues. - The next layer, the muscularis, contains bands of smooth muscle tissue arranged in longitudinal and transverse bands to contract the walls of the cecum. Contraction of the muscularis results in the mixing of chyme with bacteria and the propulsion of chyme into the ascending colon. - The outermost layer of the cecum is the serosa, a layer of simple squamous epithelial tissues. The serosa produces a slick serous fluid that lubricates the exterior of the cecum and protects it from friction with the surrounding tissues of the abdomen.